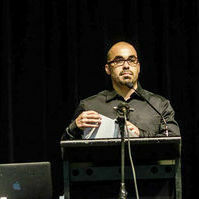 John D. Marquez is an Associate Professor at Northwestern and a critical race/ethnic studies scholar who was trained in the field of relational ethnic studies. He works across and against traditional disciplines, identitarian frameworks, and nation state boundaries. Dr. Márquez’s scholarship and teaching peruse the borders of and build bridges between Black Studies, Latin@ Studies, and Native American Studies. His work facilitates conversations around prisons and punishment; critical race theory; racial capitalism; Black politics; Xicanismo; indigeneity; borders and borderlands; post-colonialism; decolonization; settler colonialism; neoliberalism; and social movement theory.